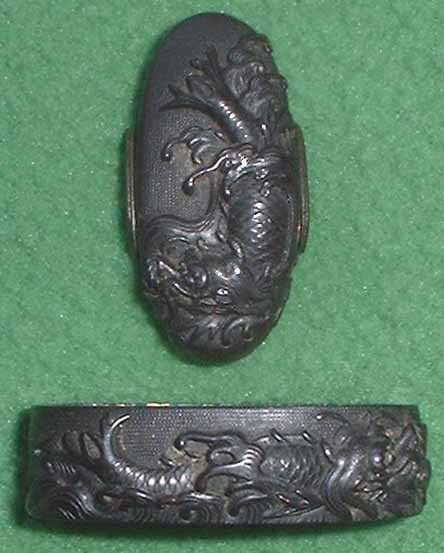 There are animals appearing on sword fittings, but some of them are hard to understand. Because they are not found in the real world. There are some animals those are come from mythology. Now we introduce some of them. 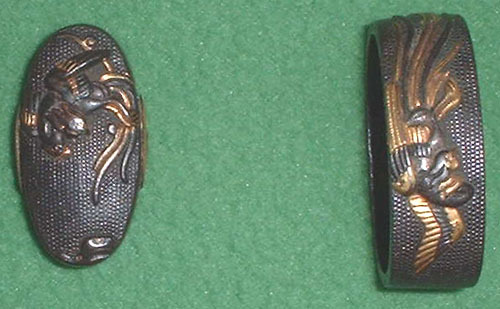 Dragon is very popular on sword fittings. Japanese dragons have no wings, but can fly. Dragon grows up in the water, then it fly out from the water to the sky as tornado. 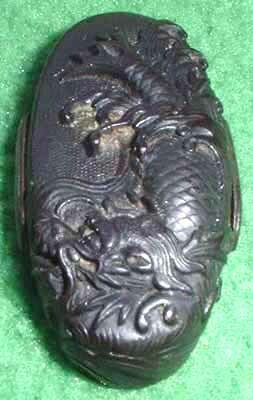 Some dragon has a dragon ball (HOSHU) that can realize any dream. Dragon ball can appear in his hand or on the neck belt or above his head. Sometimes a dragon chases the ball. Usually the ball is not very round, it has a small summit on it. Male has a sword-like tail. Blue dragon is a guardian for east. Shishi is a lion, but it is not a real lion. We don't have living lion in Japan, so the feature is a little different to the real lion. The most famous story about shishi is, mother shishi throws her children down to the valley and she grows up only the children who climb up from there. Shishi often appears with tree peony, that means king of beast and king of flower. The feature is, dear-like body, cow-like tail, horse-like toe, and one horn on the head. It is a symbol of good emperor. Sometimes, it is pictured with two horns. Sai is a kind of unicorns. It looks like kirin, but the big difference is sai has a shell on his back. In old China, sometimes sai appears as rhinoceros. I wonder if the Sai in mythology is made from rhinoceros. The feature is elephant-like nose, cow-like tail, tiger-like feet, and bear-like body. It cleans wicked wills. 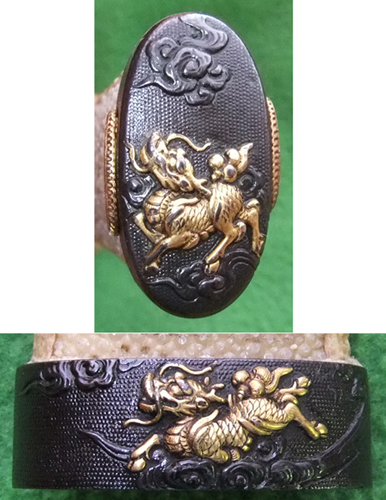 The nose of this menuki is not so long, but sometimes it can be longer like elephant. There are several kinds of phoenixes. They are holly birds. It often appears on paulownia tree. it means a holly companions that holly bird on holly tree. On the other hand, this motif is a symbol of "12" or "December" in Japanese card game. Red phoenix (SUZAKU) is a symbol of fire and guardian for south. The feature of it was monkey-like face, tiger-like feet, and snake tail. It is a king of fishes, having a tiger-like head and stings on the back, and spouts plenty of water from the mouth. The pose, head down and tail up, is common. Sometimes it is put on the roof to save fire accidents. 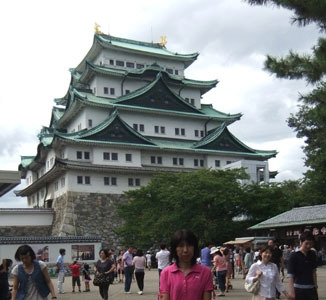 One of the most famous shachi, the golden couple on the Nagoya castle.